Eiffel Tower in Paris France. When was the Eiffel Tower built? Technology and history of the eiffel tower. Planning a visit to Paris or just curious... when was the Eiffel Tower built? 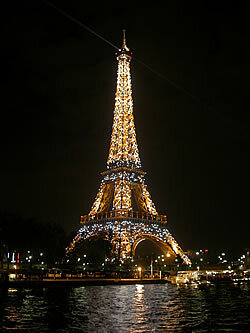 The Eiffel tower in Paris was inaugurated on 31 March 1889. It was the keystone of the Universal Exposition celebrating the hundredth anniversary of the French Revolution. Who built the Eiffel Tower? It was built by Gustave Eiffel. With 2 million visitors the first year and almost 6 million people a year today, the Eiffel Tower is a real crowd pleaser. At the crossroads of the entire world, 180 million visitors have come since its construction. It's not surprising when you consider the Eiffel Tower is the monument that best symbolizes Europe. It's also the one tourists prefer. See further down the address of the eiffel tower. The Eiffel Tower in Paris was built by Gustave Eiffel in just 26 months. It took 18,038 parts, 3,000 workshop drawings, 700 engineering plans and 2,500,000 rivets to raise this structure weighing 7,300 tons and measuring 1,050 feet high. It was inaugurated in March 1889, at the Universal Exhibition. It caused a violent polemic, meeting nearly unanimous hostility from the Parisian artistic world. Once the Tower was finished the criticism burnt itself out in the presence of the completed masterpiece, and in the light of the enormous popular success with which it was greeted. It received two million visitors during the World's Fair of 1889. Every visitor with a ticket to visit the monument can watch the machinery of the corresponding elevator in operation in the East and West pillars. This voyage underground, in an atmosphere which evokes Jules Verne, lets you discover the imposing hydraulic machines designed by Gustave Eiffel. This machinery is still used after being restored and computerized. First level, a vast space to stroll and relax. Playful animation lets you discover the past and present history of the Tower, the technique and know-how that it symbolizes as well as the momentous events that occurred during its life. A large circular gallery, with explanatory panels as aid, leads you through the sites and monuments that make up Paris. A section of the spiral staircase that Gustave Eiffel used to reach the summit during the inauguration in 1889. The original hydraulic pump: It supplied water to the machines of the old elevator which ran from the second floor to the top. The FerOscope: Around one of the Tower's beams, situated in a transparent bubble, interactive videos " video glasses " and luminous scenes take you on the discovery of the techniques that enabled the monument to be built, as well as everything involved in protecting the iron with paint. By raising your eyes you see steeplejack painters made of wax perched on a beam, the replicas of the painters who work on the Tower every seven years. 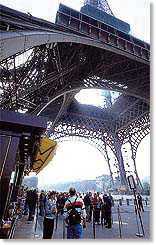 The Cineiffel is a room with unusual images of the Eiffel Tower. The Totem, a series of 8 television screens invites you to a higher space to discover the magic box of virtual images depicting Gustave Eiffel and his Tower. An electronic telescope to discover Paris in all its detail. A cinema room where the wall of screens recalls the history and great moments of the Eiffel Tower. The Observatory of Tower Top Movement: an original and unique system that monitors, in real time, with a laser beam the oscillation described by the top of the Tower as the function of the wind and temperature. These movements are calculated by a computer linked to sensors. It is at this level that you take the elevator which goes to the summit. This is the perfect floor to make a photographic study of Paris and its monuments. You will also discover animated window scenes evoking the construction of the Eiffel Tower, operation of the old hydraulic elevator that ran to the top until 1983 and the current elevator. An electronic panel indicates the number of entries as visitors enter the Tower, with the total number since its construction, and mentions some of the more famous individuals. The spectacular ascension is made in panoramic elevators which offer a view of the extraordinarily audacious architecture of the monument. The 180 meter climb ends in the discovery of a panorama view of Paris. There are two levels, one in the open air and the other under shelter, let you wander around and appreciate the view by day and in the evening. At the top of the Eiffel tower you will see Gustave Eiffel's office. 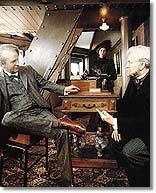 A reconstitution presents Gustave Eiffel receiving Thomas Edison. Panoramic tables will let you study the main Parisian sites. The orientation tables show directions and distances to main towns all over the world. Dioramas make a presentation of events that have marked the history of this floor. Consistently modern, the Eiffel Tower in Paris makes a special effort to surprise visitors. Do not miss the latest futurist, interactive attraction - the Eiffel Tower Visitors Galaxy - where you take part in the construction of a virtual Eiffel Tower which you can recover later on the Internet. In conjunction with the Caisse Nationale des Monuments Historiques et des Sites, the Tower offers groups a series of conference tours, highlighting the history of the monument in its time, its contribution to modern metal architecture, and all the scientific and technical applications experimented on the Tower. Information and requests: Caisse Nationale des Monuments Historiques et des Sites, tel. +33 1 44612166; fax: +33 1 44612195. RESERVATIONS: Société Nouvelle d'Exploitation de la Tour Eiffel, Champ de Mars, 75007 PARIS. Group rates: The reduced rate for groups of children (minimum 20) aged < 18, is applied directly at the cashdesk without any prior formality. These conditions are not applicable on Saturdays, Sundays and French national holidays. For groups of adults, there is a special rate according to the season. This information is subject to changes. Make sure to verify by contacting the Eiffel tower.